Here’s our Top Picks for the Weekend of September 8th & 9th! It’s Sac Open Studios season! We love the chance to get kids face-to-face with the artists in our community, and maybe fill our homes with some of their art! Teach kids to support local artists—they beautify our city in so many ways. Alliance Française de Sacramento is having their first-ever Family Picnic and Pétanque Event.Grandparents get in free at Fairytale Town and the Sac Children’s Museum. We also have to give props to the public library this week. We’re so grateful to have such amazing, free programming. Libraries are not just for books… they are also for Slime-Making and Pirate Tea Parties, as our luck would have it! Have a great weekend! Sunny highs of 94/93 forecasted for Sat. & Sun. FRIDAY… The Plant Foundry is hosting a family-friendly Pop Up Beer Garden at their Oak Park location this Friday, 5pm – 10pm. Bambi’s Vegan Tacos will be on-hand to feed hungry little bellies while you find things to plant!Let kids pick out colorful, leafy greens to put in the ground, and then enjoy your family harvest of sturdy, fresh-picked leaves all winter long. Kids love kale chips and smoothies! They are otherwise open 9am – 6pm Sat./Sun. Deadhead 1,200 roses at the all-ages volunteer deadheading event at McKinley Park Rose Garden. The 1.5-acre garden has 1,200 rose varieties and eight perennial beds. This year they started monthly volunteer events open to the public each second Saturday of the month. They will be pruning off anything that “wouldn’t look gorgeous in a bouquet.” Trainers will be on hand to show you how it’s done. They do have some supplies they can loan out on a first-come, first-served basis. If possible, bring your own garden gloves, buckets, hand trowel or bypass clippers, and wear a hat or visor, and closed-toed shoes. Kids need a signed waiver form. There are also opportunities for individual volunteer orientations: Once trained, you can volunteer on your own schedule! For more information or to get the volunteer waiver form for kids, contact friendsofeastsac. Sat. 9am – 12pm. Free. McKinley Park Rose Garden on 33rd St. & H St.
Continue an art-filled weekend. 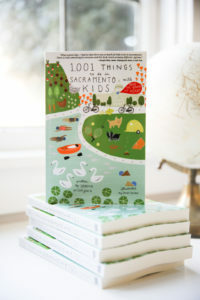 Download the guidebook and maps for Sac Open Studios here.